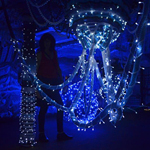 Slow Travel, we all have our own idea about what it means… or not. When we talk about the concept of Slow Travel to people in other countries many haven’t heard of the term. But most relate enthusiastically to the concept once we explain it. Among those who are familiar with the term there can be wildly varying views regarding what it involves. It’s similarly subjective when it comes to what constitutes a Slow Travel photo. For me, it’s a bit like why one completely blurred photo might be an evocative work of art whilst a crystal sharp, technically perfect image of somewhere spectacularly beautiful can be a visual dullard – the equivalent of a fashion model with no personality. The photographer has seen something different and managed to successfully capture a special moment… but it can be difficult to define why exactly. Our Slow Travel photos are often snapshots in time of an experience which has left a lasting impression. Why that is might only be obvious to us. As a photographer I can only hope that some convey the merest taste of what we felt at the time. These are seven (hopefully) Slow Travel scenes from the first half of 2018. 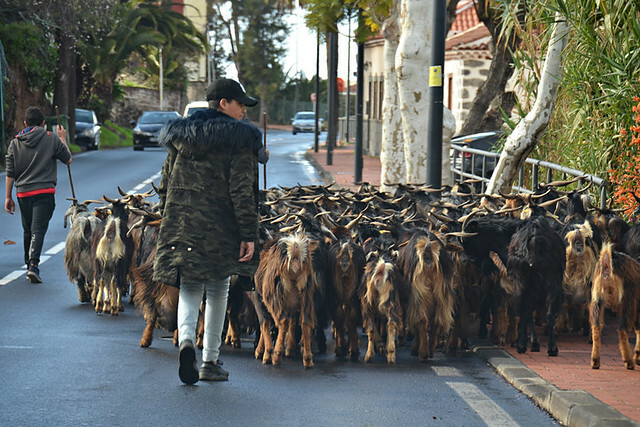 Many might think this is not a typical Tenerife scene, yet it is a reflection of what is relatively normal daily life in the northern hill towns. We’ve been stuck in goat road jams many times on the island as goatherds shepherd their herds between one pasture and another. What is particularly nice is the goats are automatically given priority, even on busy main roads. There’s never any impatience at having to wait whilst the animals take their time, munching at anything which catches their eyes along the way. This group were ‘going home’ after an agricultural fiesta in January. Walking and countryside scenes don’t necessarily always say Slow Travel as far as I’m concerned. There has to be a context which gives it meaning. There are aspects to this shot from Andros which will be unknown to anyone but us. 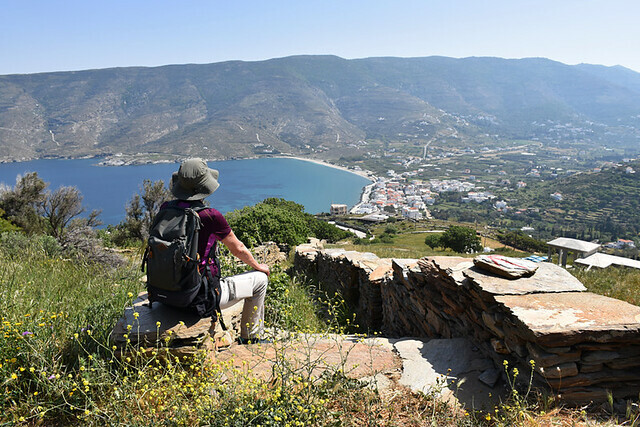 It was the final route of a week walking across the Greek island; we’d just climbed across four ridges to reach a point where we descended for the last time; the village on the coast was the full stop to our journey and we wanted to take a few moments for reflection. 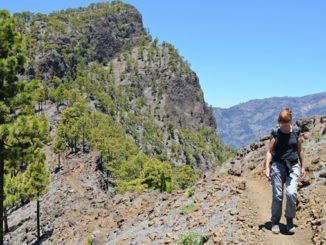 But there are facets of the photo which are designed to subtly signpost what it’s all about – the dry stone wall (a feature of routes on the island) lining the path leading downwards toward the sea. Additionally, the red arrow on the slate directs the way forward, it should lead the eye just as it led us. 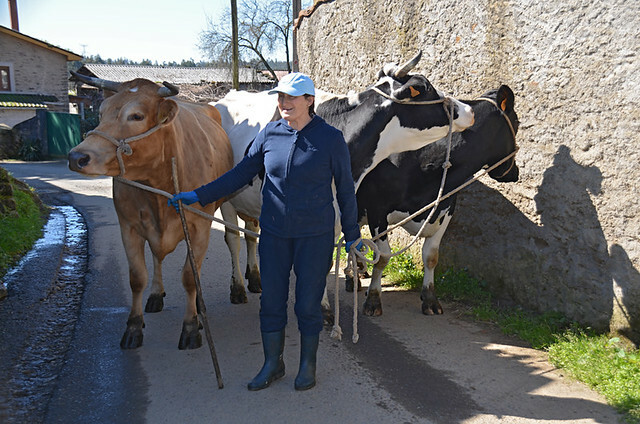 A huge part of what it means to walk the Camino de Santiago involves the people you meet on the path. Some of these are other ‘pilgrims’, some are local people. Although our time on the Camino was brief, the few locals we met along the way were friendly and supportive of pilgrims, smiling and happily posing for photos (something they must be asked to do countless times). Their interaction added depth to the route. The photo I really wanted was of a hipster fisherman decked out in a green cape who, with one wader-clad food resting on a stone wall, cast his line from an old bridge. He looked as though he could have been placed there for a countryside fashion shoot. But it was chucking down at the time and I didn’t want to risk the camera so here’s a farmer with some dairy cows instead. 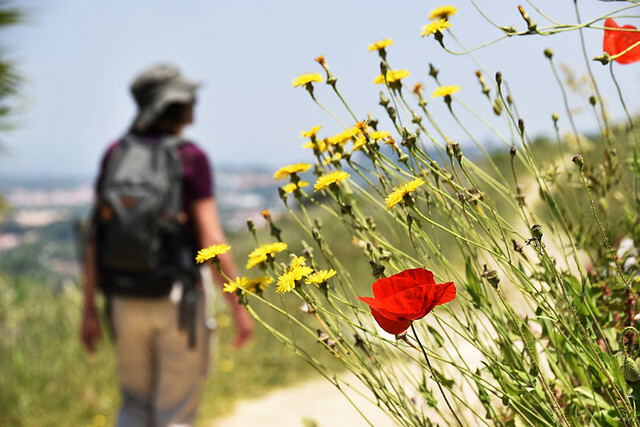 The message of this shot taken on a ridge route south of Lisbon in Portugal was quite straightforward – it’s meant to say ‘warm walking in the countryside in spring.’ Simple as that. Many Slow Travel images I see tend to involve rural landscapes. However, towns and cities have rich seams ready to be mined for interesting Slow Travel scenes. There’s often a greater wealth of ingredients, especially as Slow Travel is partly about embracing the culture of any destination and cultural activities aren’t difficult to find in traditional urban centres. 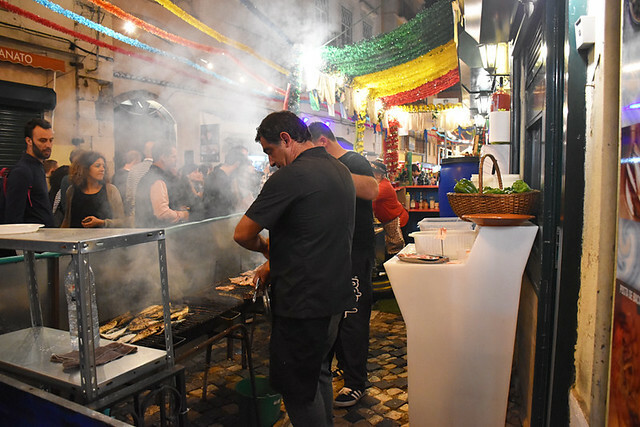 In a city where numbers of visitors increasingly dominate, this June festa in the Alfama district in Lisbon had a distinctly local flavour and soundtrack. 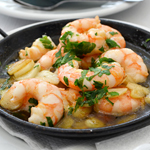 The old district’s narrow streets, decorated like a piñata, were packed with stalls selling grilled sardines (just in season) and zingy caipirinhas. When we visit any new location and are looking for what makes it different from other places, it can be figuring out the relationship, both past and present, between humans and nature which unlocks the key. This was taken at a sea lagoon on the Troia Peninsula in Portugal. The long strip of land is known for its beaches, natural beauty, and birdlife. 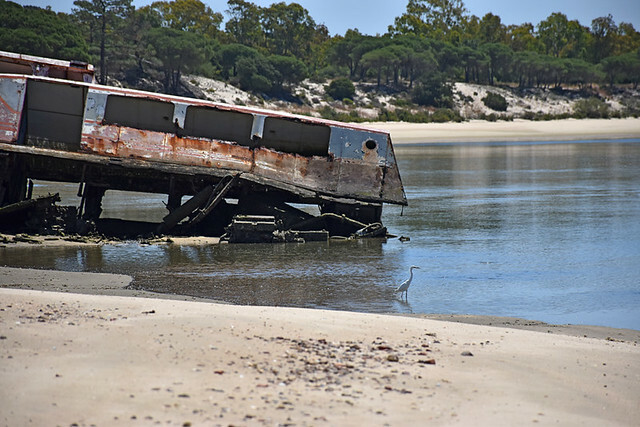 The Sado Estuary it curves around teems with boats and ships of all shapes and sizes – fishermen, ferries, cargo ships, flat-bottomed river boats. 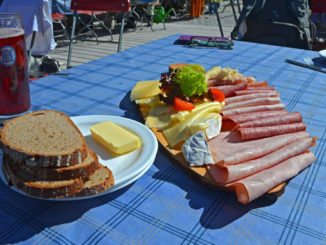 This photo was meant to give tasters of all those characteristics in the one scene. Want to show Slow Travel in Venice? Show people cruising canals in a gondola. It’s easy and maybe a bit of a travel cliché. On the other hand, the sleek boats look super and are a key feature of Venice. But this image is as much as about what’s going on around the gondola – the crumbling plaster on the walls of houses alongside the canal; the small bridge across the canal (notice there are no selfie takers); the tables belonging to bars and restaurants in the background; and, most importantly, the girl eating an ice cream on the steps. 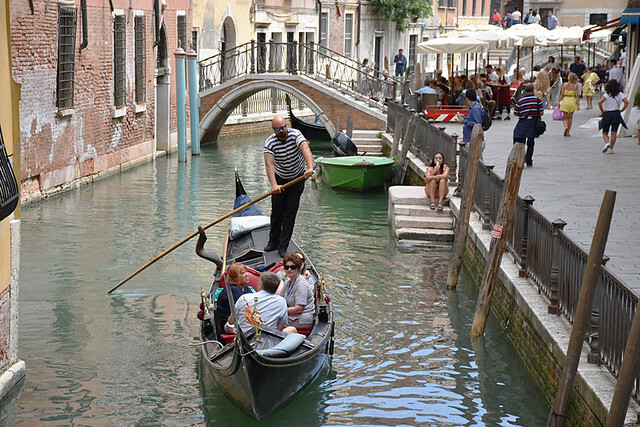 The Slow Travel message here is about relaxing and enjoying one of Europe’s most romantic cities, and that not all of Venice is overrun with too many visitors. In the end, and labels cast aside, the purpose of all of the above is to try to give a true flavour of any given destination. If they come close to that, I’m a happy person.